GH Services is the premier Canadian Muse Receptor dealer. If you want to buy a Receptor in Canada, this is the place! GH Services is located in the Niagara Region of Canada, near Toronto and the Canada-U.S. border. Owner Greg Holmes is a long-time musician, ready and able to help you with any questions you have. More about GH Services here. 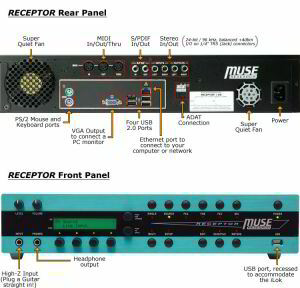 Notice: Muse Research no longer sells Receptor hardware. They have changed focus to licensing their intellectual property. This page is kept here for informational purposes, since we no longer have any of these units in stock. Muse Receptor is a 2U rack-mountable multi-timbral sound and effects module that runs standard VST instruments and effects. It combines the power of a computer with the ease-of-use, portability, and reliability of dedicated synth and effects hardware. Receptor's intuitive, mixer-like architecture combines up to 16 different audio sources, which can be either internal VSTi instruments or external analog/digital inputs. Each source is then routed through its own inline effects matrix that allows three VST plugins to be configured in every possible parallel/series arrangement. From there, each source is sent to a dedicated mixer channel, where the sound can be further processed by sending it to two dedicated effects busses, each with another fully configurable VST effects matrix. There is yet another VST effects matrix on the master output, for mastering and sweetening effects. In all, Receptor provides architectural support for as many as 16 simultaneous VSTi instruments and 57 VST effects. All this effects power can be harnessed stand-alone through Receptor's front-panel interface, or you can connect a mouse, keyboard, and monitor directly to Receptor. You can also network it to your Mac or PC and control it remotely from a window on that machine. Receptor's audio I/O was designed for superlative sonic performance, with 24-bit / 96kHz converters, balanced +4dbm input and outputs on 1/4” TRS connectors, as well as S/PDIF stereo digital I/O, and ADAT "lightpipe" multi-channel digital audio output. A front panel, high-Z instrument input provides support for guitar and bass players. MIDI I/O supports your keyboard rig and a convenient USB port provides support for several USB MIDI devices. And, of course, you can plug your headphones into the front panel jack. Receptor is robust and portable, allowing you to enjoy the latest plugin software live at a gig, or moving from studio to studio. If there's a power outage, Receptor restarts to where you were in seconds, making it perfect for live performance. Receptor is complete and ready to go, with its hard drive pre-loaded with a large library of pre-installed free VST plug-ins. Premium brand plugins are available in demo mode, and full versions can be purchased by visiting the Plugorama web store. 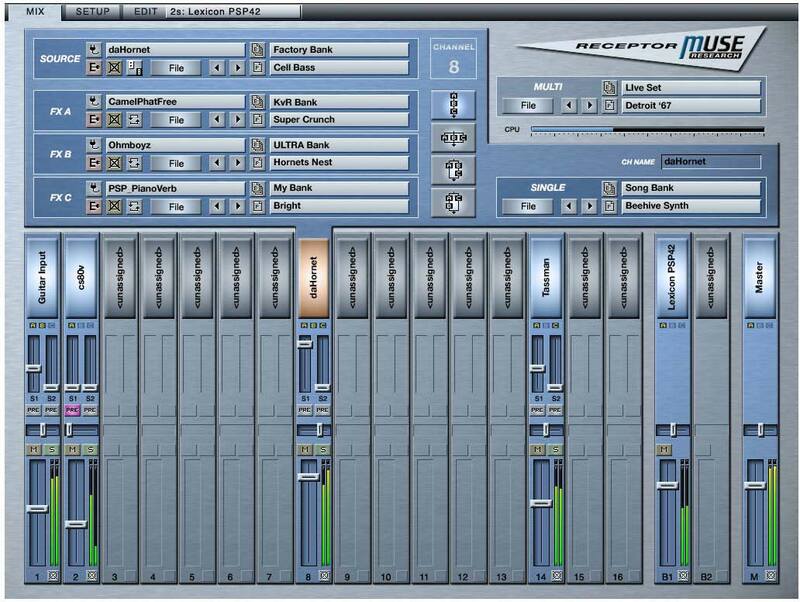 Receptor currently comes pre-loaded with the VST instruments shown at left. The ones with [##] are pre-installed and will operate fully. But if you load them (and click Yes on the pop-up that appears), the "##" will change to a 30-day countdown until the demo period expires. Once expired, they will then remain inactive until they are purchased online. This list may change in future versions. Also, Receptors with the KOMPLETE package have none of these plugins, since they are not really needed once you have KOMPLETE. If you really want some of these plugins, you can install many of them yourself, since most of them are free plugins. Receptor currently comes pre-loaded with the VST effects shown at left. The ones with [##] are pre-installed and will operate fully. But if you load them (and click Yes on the pop-up that appears), the "##" will change to a 30-day countdown until the demo period expires. Once expired, they will then remain inactive until they are purchased online. This list may change in future versions. Also, Receptors with the KOMPLETE package have none of these plugins, since they are not really needed once you have KOMPLETE. If you really want some of these plugins, you can install many of them yourself, since most of them are free plugins. Contact us at ghservices.com@gmail.com, or call our toll-free order line 1-866-666-7858. Receptor 2+ models include support for the Pace CDRM copy protection scheme, an external SATA drive port (on Pro models) for connection of additional high speed external storage, many free plugins plus more that are unlocked upon registration, the Ultimate Sound Bank Plugsound BOX collection of instruments with hundreds of presets ready to go, NI Komplete 8 and IK Total Workstation pre-loaded (so you purchase and authorize them easily later), as well as premium RECEPTOR software such as Pianoteq, M-Tron, Discovery PRO, Albino 3, and Lounge Lizard 3, all available on a 30 day free-trial basis. Coming soon! The MuseBOX features a solid state drive, a CF card slot for removable storage of additional plug-ins or smaller "ROMPLER" libraries, and an option for installing an internal hard drive for storing large sample libraries. Street price is expected to be under US$1000. Expected to be available in Q2 2011. Check out this NAMM 2011 video from Gearwire.com. Base unit includes 4 GB RAM, Intel 2.9GHz Dual Core CPU, and a 1 TB Hard Drive. You choose the Receptor hardware platform you want (VIP, Pro, or Pro Max). These products are priced for Canadian customers, but special arrangements can be made for other countries. For Canadian sales, the price includes shipping and sales taxes (GST/HST for sales in Canada). Preferred payment methods are, in order: e-mail money transfer (INTERAC), bank wire transfer, certified cheque, money order, PayPal (+3%), Visa (+4%), MasterCard (+4%). Credit card payments for non-Canadian customers are in CA$ with exchange rates chosen by the credit card companies, resulting in minor variations from the prices given here. It is usually possible to use PayPal even if you don't have a PayPal account. More memory so you can load massive libraries and tons of sounds. More processing power so you can run more plug-ins with less latency. Higher hard drive throughput for more polyphony. 10X the networking speed for improved UniWire performance and faster file transfers from your computer. All Receptors include over $400 of free plug-ins that can be unlocked when you register the Receptor at Plugorama. 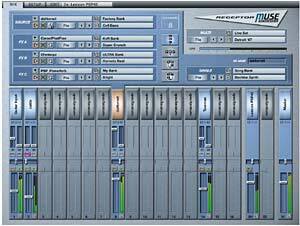 The specific plug-ins included are listed here. Muse Research ran a side-by-side test between the Rev C and the 2 Pro Max. They were able to load 5 usable instances of B4II in the Rev C, which topped out at 8 instances before it could no longer function (CPU meter was reading about 85% used). With the 2 Pro Max, they loaded all 16 slots and the CPU meter was only about 33%. The 2+ models can handle even more. * At time of release the Receptor OS is limited to 4 GB. Future updates have potential to increase this. Most available plugs are 32-bit and are built for 32-bit OSs, therefore the total amount of RAM they can access is 2 GB. However, the Series 2 models are set up to be 64-bit compatible when the industry moves in that direction. TP-LINK has a tiny USB-powered wireless router that can be used with Receptor, to provide remote access to the Receptor GUI. The folks at Muse have tried this one, and report that it works well for short-range connections. Here's the TL-WR702N 150Mbps Wireless N Nano Router. This update will include support for the RACK MODE and LIVE MODE found on newer Receptors, and it will also include support for KOMPLETE 9 and 9 Ultimate. Muse says that this version will work on the RECEPTOR VIP, TRIO, and QU4TTRO models, and is actually included on new shipping units. But they caution that K9 is not installable on Receptor 2 or 2+ machines at this time, because 2-class units emulate the Windows Vista world, which K9 does not support. Rev C and older machines do not have the power to run K9. 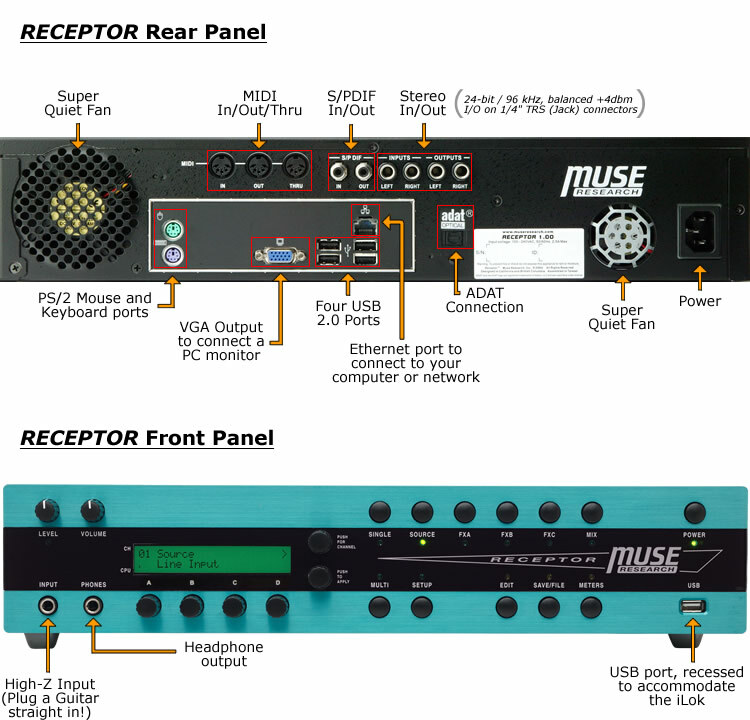 However, Muse is working on an update for Receptor 2 and 2+ units so they can install K9 and K9U. Here's the KVR forum link. Muse Research has just released an installer for Synthogy Ivory on Receptor VIP, Receptor Quattro, Receptor Trio, and Receptor 2. Here's the link to the instructions and installer in the Plugorama knowledge base. Apple dropped support for SMB (SAMBA) file exchange protocol in Mac OS X Lion, which causes problems for Receptor Tools. For Lion, Apple developed their own replacement for SMB in-house. For Receptor 2 users the differences are negligible: you can still connect to the viewer and Receptor's hard drive without issue. However, if you're a Receptor 1 user you will lose the ability to connect to your hard drive, because Apple's SMB replacement does not recognize the older implementation of SMB used in Receptor 1. And in both cases Direct Install is broken because it looks specifically for a functional SMB connection on your Mac to run. It can't find that on Mac OS X Lion, so it doesn't allow DI to launch. Muse has developed several work-arounds for Receptor 2 users so that they can still get software installed without Direct Install on a Mac OS X Lion machine. If you're interested in learning more about this or Apple's replacement for SAMBA just search for "Apple SAMBA replacement". There is a known bug in Kontakt 4.X involving multicore processing that causes glitching in the audio. Muse recommends that you turn OFF multicore processing inside Kontakt 4.X and also turn OFF dual core mode in the Receptor Setup page. These settings should stop the glitching. Muse is working with Native Instruments to fix the problem. Older versions of Kontakt do not exhibit this behavior. There is a problem using Kontakt 4's "add a library" feature on the current Receptor OS. This can be easily fixed by using Kontakt 3.5 or Kontakt 3 Player. If you do not have access to the free Kontakt 3 player then contact Muse Research support on the Plugorama help desk. After updating Mac OS to 10.6.5, Receptor Remote Control may not work for you. For now you can connect to Receptor using a third party VNC app. Here's a Knowledge Base article that explains the solution: http://www.plugorama.com/kb.php?id=440. Meanwhile, Muse is working a fix for their viewer app. Muse Research and Development has announced an agreement with Ultimate Sound Bank to provide sounds for the upcoming MuseBox, a highly versatile Musical Instrument and Effects Box, being co-developed between Muse Research and Peavey Electronics. Ultimate Sound Bank will provide the pre-installed sound set for the device that includes all the essential keyboard sounds (acoustic pianos, electric pianos, organs, plus synth leads and pads) required by the gigging musician, as well as expansion sound sets that will be sold to customers both on-line and at retail. RECEPTOR 2 now supports the Native Instruments KOMPLETE 6 bundle of virtual instruments and effects, and the RECEPTOR 2 with KOMPLETE Inside now comes with KOMPLETE 6 pre-installed. KOMPLETE 6 brings together seven cutting-edge products. This collection represents Native Instruments’ most powerful software tools, with some 7,000 presets and 60 GB of samples. The plan is to offer a new drive to Rev C users (in which case they keep their old drive as a backup) and offer low-cost installation of any sofware they own. The good news is that most software won't "eat up" additional authorizations because the mobo hasn't changed... all the customer needs to do is enter in the auth number and it should "just work". We are also thinking about offering a way to send in your old drive and have it be reformatted and updated, and then we would also install the software you had previously installed (if its something we support). This eliminates the cost of buying a new drive, but it also gives you back an IDE drive that won't perform as well as the SATA Drive we would sell you in the other case. The third option is to come up with a script on a USB thumb drive that you would boot off of and that would reformat your drive in the field and install the new software. We're really reticent to do this because it is SO easy to brick a drive with this kind of thing, all you need to do is have a power glitch or bump the USB connector and you are in a heap of hurt. We know that our customers can do this, but its more our desire to make sure that the update happens absolutely reliably that is making us shy away from this approach... The added downside is that you'll have to start from scratch installing all your software, something that will take a very long time. - On a Receptor 2 PRO, you can run Ivory at a 32-sample buffer at 96kHz sampling rate. - One owner runs 57 instantiations of Guitar Rig on a Rev A (!) Receptor. On hearing this you might ask WHY (glitchless patch transitions and to layer sounds) and then you might ask HOW (using snapshots). That's all FX slots filled up (19 x 3), and all 16 channels driven from the same analog input. There was a bug in Apple's previous OS versions which prevented remote access to the CD/DVD drive (which blocked Direct Install from accessing files on your installer disk). Apple fixed this in OS 10.5.6. The MuseBOX is based on the same MuseMachine software technology that powers the company's RECEPTOR 2 line of virtual instrument players and features a solid state drive for storing both the OS and many plug-ins, a CF card slot for removable storage of additional plug-ins or smaller "ROMPLER" libraries, and an option for installing an internal hard drive for storing large sample libraries. The hardware I/O features 1/4-inch stereo line outputs, a 1/4 inch input, stereo S/PDIF output, front panel headphone outputs, a VGA monitor output, MIDI input, and a 2-line LCD display and rotary encoder similar to its bigger brother, the RECEPTOR 2. Like the RECEPTOR 2 line of music instruments, The MuseBOX is both a highly efficient and ultra-stable way to run virtual instruments and effects. The MuseBOX will retail below US$1000, and is expected to ship in late Q2 or early Q3 of this year. and the ever-iconic Madonna (Ric'key Pageot on keyboards). Famed New Age composer and performer KITARO has added another Receptor PRO to his rig, as he begins an extensive tour in the Pacific Rim. Toby Keith's keyboardist Rex Mauney is loving his new Receptor PRO, receiving big-time compliments from his FOH mixer for his new & improved sounds! Over in the UK, some of the highlights of the tour season include several acts at the legendary UK Glastonbury festival using Receptor, including Crowded House, John Mayer, and Billy Cobham with Asere. Also out and about this summer on tour are MIKA, Mogwai, The Waterboys, Joe Sample, Rooney, and many, many more. Other tour news: Jordan Rudess recently upgraded his Receptors to PRO models and added the latest software including the Italian Grand from Synthogy. Pendulum is out touring around the UK and parts of Europe this summer with their newly upgraded... what is it now - 10? 12? Receptors... And STS9's Hunter Brown (guitar) and David Phipps (keyboards) are now toting Receptor PROs on tour... retiring their laptops to more mundane tasks! Note: Every one of these pro players bought their Receptor - they did not get them free. The exception was Jordan Rudess, who did some special promotional work a couple of years ago. This first version supports Native Instruments plugins and will allow you to run all the updates. In the past you would need to wait for Muse to build the installers but this is changing. This is a start, and most certainly Muse now will be able to add plugins at a much faster rate than ever before. If you use Direct Install please take time to complete the User Survey located at the Direct Install Home page. This version does not yet support "Powered by NI" instruments, but subsequent versions of Direct Install will be expanded to support more vendors. Included in the Receptor Tools 1.2 package, which is required for Receptor v1.7 (available soon), is UniWire 1.2. Aside from fixing several bugs and improving overall compatibility, UniWire 1.2's most obvious new capability is that it works with multicore processors. You no longer have to disable multicore support in your host application in order to use UniWire." The "Direct Install" feature of Muse Receptor is in the final beta-test phase. This feature allows you to install the plug-ins that, in the past, were difficult to install because of specific software install methods. Initially, Direct Install focuses on Native Instrument plugins, mainly because they were among the hardest to install manually. Once the beta is complete for those plugins, the Direct Install feature will be expanded to included simpler plugins. Muse feels that the time spent developing this feature is time spent well. 2008-04-15 - Muse Research Receives the Remix Technology Award! Remix presented Muse Research's Receptor with Komplete Inside their Remix Technology Award for 2008 on the night before the NAMM show. Presenting the award from Remix Magazine was Markkus Rovito following an exceptional review of Receptor by Jason Blum. This winter saw record rains and winds in California but that didn't stop Receptor user Kenna from blowing away crowds in San Francisco during their recent stop playing his very unique and hip music. Of course lots of tours are in rehearsal or are getting ready to embark on tour for the spring, including such greats as Rod Stewart whose percussionist Matt O'Connor has added a Receptor to his rig, soul diva Alicia Keys who will be using Ivory, EWQSO Gold XP, M-TRON, and other virtual instruments on tour. Did you check out the Super Bowl half-time show with Tom Petty's keyboardist Scott Thurston using his Receptor? Not a football fan? Then surely you caught Rami Jaffee with his Receptor playing with The Foo Fighters during the Grammy Awards! Receptor will be a big part of the Reba McIntyre / Kelly Clarkson joint billing tour as the keyboardists for both bands are using Receptors! And we're pleased to welcome Rex Maundy, keyboardist for Toby Keith to our Artist family. Julio Iglesias's keyboardist Christian Tamburr is making some impressive music thanks to his new Receptor with Komplete Inside, coupled with Ivory and the Italian Grand expander pack. And Cher is gearing up to headline an extended run in Vegas with Paul Mirkovich serving as M. And American Idol is underway with another hit season with Receptor user Herman Jackson manning the keyboard. Finally, Scotland's coolest band, Mogwai, picked up their first Receptor - keyboardist Barry Burns now owns a Receptor PRO. Trans Siberian Orchestra, Tori Amos, The Eagles, Crowded House, Billy Joel, Foreigner, Foo Fighters, and the Goo Goo Dolls. 2007-12-10 - Muse Research Receives the Remix Technology Award! Remix just announced that Receptor with Komplete Inside receives their Remix Technology Award for 2008! The editors of Remix determined that Receptor with its unique all-in-one and road-worthy design combined with the incredible power of Native Instrument's Komplete 5 collection of virtual instruments and effects was simply too good not to receive a technology award. The award will be presented at the January 2008 NAMM show in Anaheim California. Under some rare circumstances the possibility exists that the Receptor System Log could completely fill Receptor's operating system partition, making it so Receptor cannot boot. If this were to happen, the system would get stuck forever, looping in Recovery Mode. The only solution once this happens is maintenance at Muse's facility. This "Log Fixer" download restricts the log file from exceeding 32MB and should be applied to all Receptors pro-actively. 2007-10-15 - Pianoteq is now available as a native supported Receptor plugin through Plugorama. Synthogy Ivory Italian Grand Expansion Pack support - finally, the Fazioli arrives on Receptor. Wave Arts MasterVerb5 - This new reverb sounds great, and doesn't kill your CPU. Yes! Wave Arts Panorama5 - a surround sound panner plug-in. Wave Arts FinalPlug5 - perfect for insertion in the MASTER section of Receptor. Wave Arts Multidynamics5 - a truly powerful multi-band compressor. Wave Arts TrackPlug5 - a comprehensive channel strip that is also super efficient. discoDSP Discovery PRO - a huge new plug-in with incredible expressive power. Sonic Projects OP-X - That classic Obie sound finds its way to Receptor! Sonic Projects OP-X PRO - And its even better with the PRO version! Sonic Projects Stringer - classic synth strings for all you 70's and 80's fans. Camel Audio Cameleon 5000 - Camel Audio's super synth ready to work its magic for you. Camel Audio Camel Space - amazing spatializer plug-in that must be heard! Camel Audio Camel Phat - Appropriately named, this plug fattens up guitar, keys, more. Camel Audio Camel Crusher - beat those bits into submission. High quality nastiness. GMEDIA music Oddity update - newest version of the much-admired Oddity. GMEDIA music Imposcar update - ditto for Imposcar. Modartt Pianoteq - An astounding physically modeled piano that works and sounds great. Mu Technologies Mu Voice - Ground-breaking polyphonic pitch corrector / harmonizer. Studio Devil BVC - this is a really great little free plug-in from a new company in NY. Rob Papen / LinPlug Albino 3 - an update of the remarkable LinPlug synth with presets by Rob Papen. Rob Papen / RPCX Blue - a nice VA synth capable of far more colors than its name suggests. Rob Papen / RPCX Predator - an incredibly fat and organic sounding synth with tons of presets. Way Out Ware TimewARP 2600 - give me my Arp 2600, complete with virtual patch cords! Way Out Ware KikAxxe - cool monophonic synth with step sequencer!